I wish nintendo would create more games that I can transfer my Ru/Sa pokemon into and play with them there like you can with colloseum. Like, an rpg game where you have to do something else to get pokemon, not purify them, but search for something like a lost relic but you have to face wild pokemon in all the same kinds of places you do in the gba games except that it's all in 3d, the game could have a good replay value if you have to complete it a few times to get different random legendaries like Mew or Lugia. Also, you'd win prizes when you fight trainers but the prizes are the rare things that you can't buy in stores in the other games like Max Revive and Sacred Ash. It stinks that some items or pokemon are so rare that if you make a mistake with them theres no chance of doing better the next time. This would change that. Well, that's my wish, maybe Jirachi will grant it someday! Also if you could trade with the game and every single Game Boy game! I would buy it on the day it came out. That's a ok idea, but it would screw the morale of Poke'Mon! and not everyone is a expert poke'mon! I agree nintendo should make more games! The Ancient Poke'Mon Rayqauza, is the chosen one, we seek its power! TEAM SHADOWS! That would be aswome being whateverver you wanted but you had to qulifie. 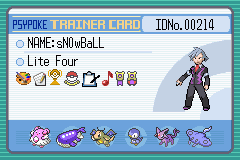 Like to be a gym leader you had to beat a harder elite four and if your really bad you get stuck working in the pokemart or something. There will soon be a post spelling out the details of the Pokemon MMORPG I created. I have every intention of proposing it to Nintendo. I've shown the details of it to several people (username AMitch included), and they all think it's amazing. My bad. I should have mentioned that I posted that because in it you choose whether you become a professor, a gym leader, a merchant, a breeder, a Rocket, a scientist, a cooltrainer, a bounty hunter, etc etc etc. EDIT: Next time use the edit button. a breeder, a Rocket, a scientist, a cooltrainer, a bounty hunter, etc etc etc. -CaptainCool. I remember you saying that!!!!!! I've always wanted to see the pokemon on the feild, not just in battle. Does anybody wish for the same thing? Although I doubt Nintendo would add such a nice feature... all they want is our money. But...getting of topic! It would also be cool to have a new Pokemon Snap. In this one you could walk around as long as you like, and it could be in Kanto, Jhoto, Hoenn, and Orre. There would be spots set up all over so you could get your pictures checked by profesors and other important people when ever. That would be sweet you could be a gym leader and people can try to take your badge. Necromancy is bad, m'kay. Don't do it.